I have recently discovered the demise of my G G Grandparents Anthony [aka John] and Mary KENNEDY nee MCCOOK. Mary MCCOOK was born in Armoy, Co. Antrim, Ireland in 1849, to William and Lilly MCCOOK [nee MCLEAN] and was the eldest of 6 children. Anthony John KENNEDY's trade was listed as a carpenter. He was born in Co. Antrim, Ireland and was the son of William KENNEDY, a blacksmith. 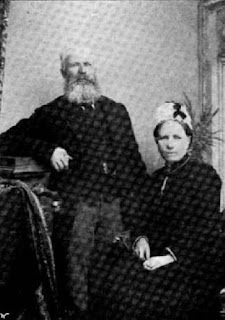 They married 20 November 1873 at the Balleymoney Registry office, Balleymoney, Co. Antrim, Ireland. Mary was 6 months pregnant and gave birth to their son Thomas Veruna Rowe KENNEDY on 20 February 1874 [he married Helen SELBIE] and within days the three of them were on board 'Varuna' via Glasgow heading to New Zealand. They settled in Christchurch and went on to have another 10 children William, Mary, Margaret Moore, John, Anthony, James, Arthur, Hugh, John William [my g grandfather] and Lena Theresa. Mary and Anthony had been an enigma to me for decades. From previous research on their children's entrance information to the Christchurch Receiving Home and Te Oranga Home, that in 1891 Mary had been classified as destitute and all her children had been put in to homes, this turned out to be a slight twist of the truth to make it more palatable to the older members of the family at the time I guess. All my research came to nothing. A newspaper item from 19 November 1891 , shows that most of their small children were taken off both her and Anthony due to neglect [drunkeness and squalor] which Anthony strongly denied, however neighbours disagreed. It also appears that Mary had been in and out of gaol over the years for drunkeness. At least I now knew that Anthony stuck with her throughout the years and did not infact desert the family as all the stories had indicated. Mary's entry in the death registry shows 8 of her children were still alive at the time of her death and that her service was taken by a Methodist minister. She is buried in Linwood cemetery, Christchurch. Her grave has no headstone. Anthony [who it appears, went by his second name of John] died on 21 July 1918 of senile decay and cardiac dilatation at Christchurch Hospital from 84 Kilmore Street, his usual residence which at that time was The Limes Private hospital. His death notice lists him as a newspaper runner aged 71 and 8 of his children were still living at the time he died. 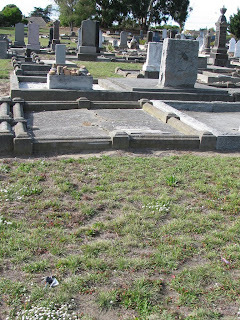 He is buried in Sydenham cemetery, Christchurch. 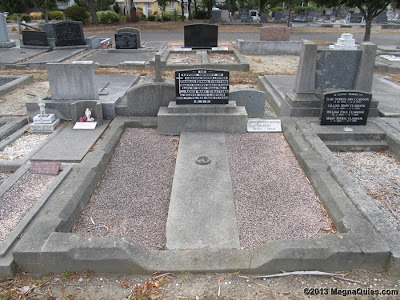 I have enquired of the Christchurch City Council as to putting small memorials on both of these graves and another ancestor who is of a different line but buried near Anthony. Current bylaws mean that unless i pay for all 3 plots and burial fees at todays current rates [equating to $5,172] I can't put memorials on them! However this antiquated bylaw is now under review and should know next March/April if memorials will be allowed. Thomas Varuna Rowe: Born 5 February 1874, England. Named after the ship he and his parents came to New Zealand on [Varuna] and the captain - Rowe. He married c1908 to Helen SELBIE. He was buried 5 June 1952 and she was buried 11 Jan 1965. Buried together at Timaru Cemetery, New Zealand. I have met a couple of his descendants from Christchurch years back. Mary: Born 21 September 1877, New Street, Christchurch - Know nothing about her. Margaret Moore: Born 1879 - Nothing further known. John: Born 1881 - died c 9 April 1881 aged 5 weeks . "Accidentally smothered" - an inquest was held in New Street yesterday on the body of an infant named John Kennedy, son of Anthony Kennedy, carpenter. It appeared from the evidence that the child had been accidentally overlaid by his mother during the night and the jury returned a verdict accordingly." Anthony: Born 20 February 1884 [Twin] - Lived South Canterbury. James: Born 20 February 1884 [Twin] - Nothing more known. Arthur: Born c1885 - Nothing more known. Hugh: Born 6 March 1886 - Nothing more known, but my mother [born 1937] can remember seeing him in Cathedral Square, Christchurch when she was very young. John William: Born 17 August 1888 [Twin], Colombo Road, Christchurch [my G Grandfather] He and his sister Lena to Christchurch Receiving Home November 1891. He married Lucy Jane EVANS on 6 April 1911 at Brides home, Sewell St, Kaiapoi, Canterbury. From 1918 until his death at Ngawhatu Hospital, Nelson on 22 October 1963 he was in and out of mental institutions, fathering children with his wife when he was out on leave when the doctors considered him okay now and then. He suffered from paraphrenia, a chronic mental illness developing often in middle life. Delusions of persecution develop and may be accompanied by grandiose ideas. The person afflicted may be able to talk quite rationally about neutral topics. He was also bi polar. Cause of death, Myocardial degeneration [a condition in which there has been a deterioration of the heart muscle] and is buried in a paupers plot in Nelson, New Zealand. He and Lucy had 6 children, the last surviving child dying in June 2009. Lena Therese: Born 17 August 1888 [Twin], Colombo Road, Christchurch. Baptised 25 May 1904 at All Saints Church, Burwood. Sponsor was Ellen BRANTING, matron of the Te Oranga Home where she was living. She married 1911 to Christopher Reynold Gow CAMPBELL. She was domestic but I have been told she was also a teacher. Christopher died 21 September 1948 and was cremated at Waikumete Cemetery but i cannot as yet find Lena's death. It is nice to think that they shared a reasonably long life together. I have found no evidence of children. I am the husband of deceased. She is 56 years of age. We lived together in Worcester Street. I am a Carpenter. I last saw her alive at 9.a.m. on Saturday. I left her at the house and came to town. I went back at 5.p.m. she was not there. I went out again at 7.p.m. I returned again at 9.00 p.m. She was still about. I stayed there all night. The police told me this morning that she was dead. She had kept sober for some time, since she last came out of gaol. I don’t know how she got into the river. She was subject to fainting fits. She never mentioned committing suicide. Thomas Read being sworn, saith that:-I am an employee of the Gas co. I was walking along Oxford Terrace this morning at 6.27.a.m. as I passed Hereford Street Bridge I saw what I took to be a human being in the water on the upper end of the bridge. She was partially immersed in the water. It was about 10 to 15 feet from the bank and 10 to 12 feet above the bridge. The water would be about 18 inches deep. I informed the police. I am a Police Constable at ChCh. At about 6.35.a.m. today I received a message that there was a human body in the River near the Hereford Street bridge. I proceeded there at once and saw the body of deceased in the River. It was lying face downward and head down stream, fully clothed, in about 18 inches of water. I think she had been washed down. I took her out & examined the body. There are no marks of violence. She probably fell in drunk and could not get out again. There was absolutely nothing in property on her. An Inquisition taken for our Sovereign Lord the King, at the City Morgue at CHRISTCHURCH of Canterbury, in the said Colony, on the 20th day of September in the year of our Lord one thousand nine hundred and eight, before HELYAR WEDDERBURN BISHOP Esquire, one of the Coroners of our Sovereign Lord the King for the said Dominion on view of the body of Mary Kennedy then and there lying dead, upon the oath of Ernest John Masterman, Charles Smith, George Englefield, Herbert Olds, George Charles Smithson, Robert Petrie good and lawful men of the neighbourhood, duly chosen, and who being duly sworn and charged to inquire for our Lord the King when, where, and by what means the said Mary Kennedy came to her death, do upon their oaths say – That the said Mary Kennedy at Christchurch on the 20th day of September 1908 was found drowned in the River Avon, but there is no evidence to show how she got into the water. In witness whereof as well the said Coroner as the said Jurors aforesaid have hereunto set and subscribed their hands and seals the day and year first above written. Fascinating family you have. I like characters full of flaws, dark mysteries and secrets to reveal. Makes our research more fun and satisfying somehow! Hi, my name is David Selbie Kennedy, would like to make contact, my ancesstors arrived on a ship which I thought was called the Verona in the 1800's,a Selbie married a Kennedy onboard the ship, my mother has a very old Bible with original hand written names from this time, been passed down through the family. I have emailed you. You'll see by the email that the information i have is rather different as the SELBIE/KENNEDY marriages [there were two], took place many years after my KENNEDY's arrived in New Zealand. I did actually come across that information recently as Bev Evans of Christchurch has put most of the Kennedy index cards online - I just hadn't got around to updating the blogpost! I really appreciate the effort you must have put in to all your information over the years! It is good to know of a possible burial for Mary and Andrew. A lot of my Kennedy relatives are in that lot and I have also found out more information on Lena - she moved around with her husband Christopher as he was a signalman for lighthouses in the North Island. I can find no children for them either. Another satisfying afternoon continuing on my diorama. This time, concentrating on making 'bricks' for the exterior. Cutting the 'bricks' for the exterior. These are made from egg cartons. After this, each corner of the brick is cut off ever so tiny so that it gives a more realistic look when glued on the diorama. Colouring the 'bricks' with soft pastels until i get the shades i want. A 'spacer' is used to ensure level placement of the bricks and an even space to 'grout' later to complete the job. Close up of the 'bricks'. Egg cartons are fabulous for this! I wanted to attempt making miniature sushi so i have. 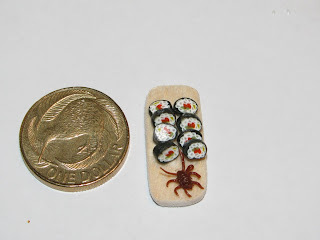 My friendly entomologist at work suggest i make a cockroach to put on them, so i did and have made a sushi board and cockroach just for him! One sushi cane does many sushi make! i must have got about 300 of them all up. A thrill of horror ran through the town last evening when it became known that the horrible crimes of murder and suicide had been committed at Arch Hill. The sad news was first conveyed to the Newton Police Station by a youth named Arthur Shannon, who at that time simply knew of the suicide of the murderer. Constable Clark sent word to the central police station, and at once proceeded to the scene of the crime. It was not until some time afterwards that it was known that the perpetrator of the rash act had also committed the fearful crime of murder. It subsequently transpired that, as usual in these sad affairs, love might be considered as the cause of the crime. Ex (& always) Cantabrian; Collection Manager- History at Auckland War Memorial Museum since 2008. Avid genealogist for 42+ years. Rampant taphophiliac; ephemera collector; lover of Canterbury history; enjoy digital photography; cemetery trawling and headstones; memento mori and 1:12 miniatures. Honorary Life Member & volunteer researcher for The Friends of Linwood Cemetery Charitable Trust. hexham northumberland hodgson telfer bellingham "royal field artillery"
Grace White on Flickr - fantastic minaturist! Just for Jess :-) - printable aquarium! It has been a harrowing time the past few months and the future is uncertain.... I suppose everyone's future is, but sometimes we can buffer ourselves from unexpected nasty surprises. I used to be able to, but now through no fault of my own - I can't. 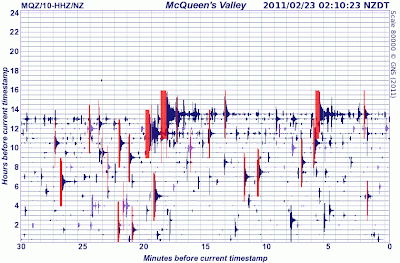 I am talking about my house insurance in post quake Christchurch. I moved to Auckland 4 years ago...exactly - August 2007. I had always had house, contents and car insurance for at least a couple of decades with AMI but as I was renting my house out in Christchurch, I had to relinquish the house insurance as AMI at this time did not offer a landlord package. Instead I opted to go with Prosure Max Landlord Insurance through 'Insurer Services Limited' [now 'The Insurance Group'] in Auckland. This policy would be underwritten by China Taiping Insurance NZ [CTINZ], a fully registered NZ insurance company and falls under the Insurance and Savings Ombudsman. The Coachhouse at Balcairn [32 Cornwall Terrace] was built around 1877 by John LISTER who was born in 1833 at Worksop, Nottinghamshire, England. He arrived in Lyttelton, New Zealand onboard the Clontarf* on 5 January 1859. He was listed as 26 and a shepherd. It seems that Sarah MARTIN aged approximately 27 also was on the Clontarf [with possibly her sisters]. John "was a churchwarden for many years and taught in the Sunday school, was a member of the school committee, and always ready to help in any good cause or assist a neighbour." . They had much to do with the lovely church which has been a private home for many many years now. Sarah married William MARTIN [note this was also her mothers maiden name] and marriage registered as 1879/1340. We have such a better understanding of the impacts of post traumatic stress disorder [PTSD] nowadays. One of the tragedies of World War 1 was that of course mental illness was not perceived as an illness per se. The impact on men suffering after witnessing horrific sights and/or battle shocks has become well known now. The angst caused to many families with men arriving back home having to recuperate, changed forever can't be imagined in some cases - very few support systems in place at that time. I have recently found the story of a Kiwi soldier who appears to have suffered much. After absenting without leave, he was considered a deserter, only to have that status rescinded in 1928 when he was identified in a 'mental hospital' in Sydney, Australia, a decade after disappearing. The torment his family must have gone through is unimaginable. Often as I'm walking around a cemetery, I come across graves that I think may hold a story solely due to the persons name... Carlo's grave was one of those and what a story I found! Carlo's headstone belied what an amazing talent he had in his trade as a stonemason and the designer of 5 major South African War memorials in New Zealand. Those at Dunedin, Waimate, Palmerston, Riverton and Oamaru. He had resided in New Zealand 47years at the time of his death and he lived at 50 Buckleys Road, Linwood. This in itself was a fascinating thing to find out, because for many years being a citizen in Avondale, Christchurch, I often passed this run down house situated beside Eastgate Mall on the way to my grandparents house and wondered what its history may have been! This has been the most surreal 5 weeks. Firstly, meet my gorgeous little grandson Joseph David, 8 pd 6 oz and 55 cm born 25 February 2011 by emergency caesarian, the latest new love of my life :) Thank you to my amazing and special daughter [and of course her hubby Hamish] for such a special wee fellow - I love you. His birth was not without stress and 'adventure' including being 13 days late! 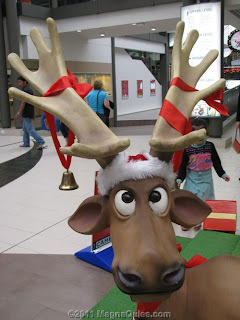 I flew to Christchurch on 3rd February from Auckland expecting to be leaving around the 16th. How wrong i was! I have just got home on 12th March. Newborn and look at Jess glowing! Once again I set off on doing a 'quick' biography for a headstone I snapped in February. Every time I say this I end up jinxing myself and it turns into a long snaking journey around many more members of the same family. This time was no exception with the STRATFORD family. I had originally spied Charles Edward STRATFORD's headstone at Bromley Cemetery, Christchurch on 27 February. Charles was living at 24 Baker Street, Christchurch at the time of his death and was an upholsterer.